The RVHD-2000 UHF/VHF HDTV Antenna is the most advance TV Antenna we sell. The Range is good and the circuity is better. RECEIVING RANGE UP TO 100 MILES! Signal does not fade while driving!!! Connect up to two TVs. Comes with wall mount adapter plate and mounting bracket. The RVHD-2000 has the most advantages when it comes to RV HDTV Antennas. Quality of reception is unmatched in the industry! Especially designed for moving recreational vehicles, it works great as a TV antenna for Boats, RV's and Caravans. Omni directional reception (with signal that does not fade while driving!!!) and supports AM/FM/VHF/UHF frequencies. Waterproof housing made of UV resistant, injection molded ASA material with super durability. SMD technology provides high gain, low noise amplification. 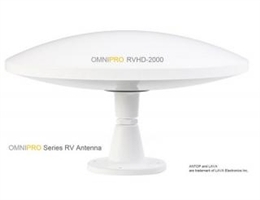 This unique technology ensures excellent performance of all OMNIPRO series antennas. Keep an eye out for new models in our OMNIPRO series family. First day, in an RV park 10 miles west of Yuma, AZ, half my channels went off in late afternoon. English channels disappeared, Spanish speaking channels remained. Why? Today I discovered that one channel dies when I turn on one of the lights in the RV. I was told by your tech that LED lights cause it. Picture is good but I want more channels. I am less than 150 miles from LA but get nothing from that area. Easy installation and great reception. 55 channels - 46 of them digital, with clear picture. HD channels almost appear sharper than they did on cable. Not hooked up to 12 volt yet I would appreciate set up info. Can it be hooked direct to DC etc.